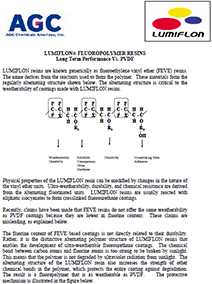 LUMIFLON® FD1000 by AGC Chemicals (Americas) is a fluoroethylene-alkyl vinylether (FEVE) alternative copolymer. 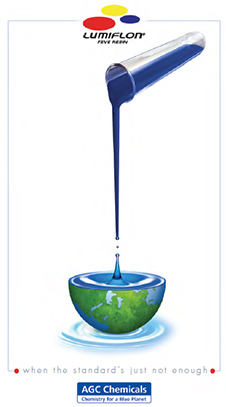 It is a water-based, milky white liquid dispersion with high OH (hydroxyl) functionality. Exhibits excellent water resistance, weatherability, and chemical resistance and shows good adhesion on primers. LUMIFLON® FD1000 is curable at both ambient and elevated temperatures. It can be crosslinked with water-dispersible isocyanates yielding coatings with high gloss, excellent durability and corrosion resistance. Suitable for field applied coatings. Possible applications include coatings for architectural, aerospace, automotive and industrial maintenance markets.